TSPSC Group 4 Answer Key Expected On Tspsc.gov.in, How to download and raise Objections: TSPSC Group 4 and other posts answer key will be released on the official website of the commission, tspsc.gov.in: TSPSC, Telangana State Public Service Commission, Hyderabad has organised the Objective Type examination for the recruitment of TSPSC Group 4 and other posts on October 10 in two sessions in the morning and afternoon. TSPSC has held Group 4 and other posts recruitment examination to fill vacancies of 1595 posts and and other posts. As the Commission has completed the Group 4 and other posts recruitment examination process, the candidates may expect the answer keys of the examination, answer key anytime will be available soon on its tspsc website. తెలంగాణ గ్రూప్ 4, జీహెచ్‌ఎంసీ బిల్‌కలెక్టర్, బేవరేజెస్ కార్పొరేషన్‌లో పోస్టులు, టీఎస్‌ఆర్టీసీలో జూనియర్ అసిస్టెంట్ పోస్టుల భర్తీకి నిర్వహించిన పరీక్ష ఫైనల్ ఆన్సర్ కీని తమ వెబ్‌సైట్లో అందుబాటులో ఉంచినట్టు టీఎస్‌పీఎస్సీ తెలిపింది. ఫైనల్ ఆన్సర్ కీ పై ఎటువంటి అభ్యంతరాలు స్వీకరించబడవు . 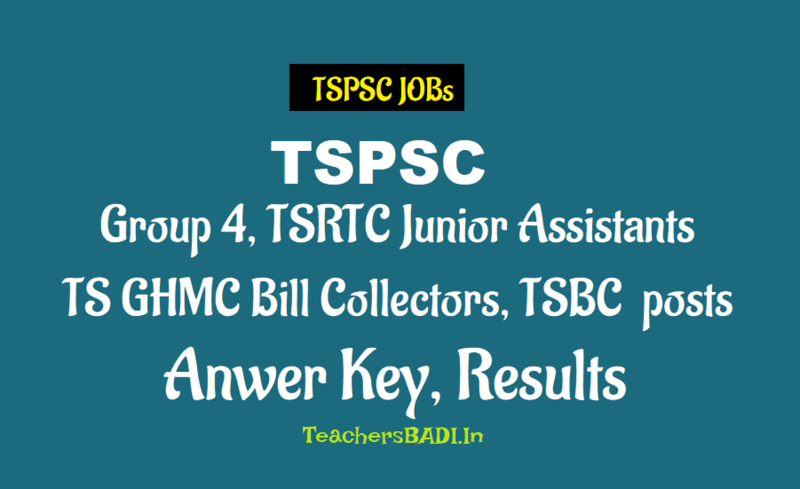 TSPSC Group 4 Answer Keys and Raise Objections: TSPSC has released the answer keys for TSPSC Group 4, Junior Assistants and Bill Collectors posts. The preliminary examination was conducted on October 7, 2019. 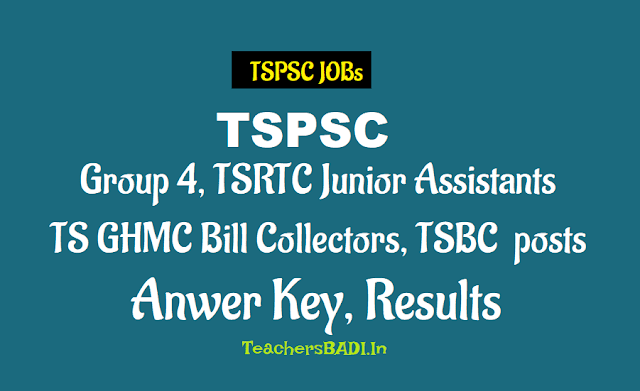 TSPSC Answer Keys for Group 4 are now available on the link provided. Candidates who have appeared for the preliminary examination for reruitment under notifications 10/2018, 11/2019, 17/2018 and 18/2018 can now check the answer keys for both paper I and Paper II. Window to raise objections would be available from October 23 to October 29 on tspsc.gov.in. Hyderabad: Telangana State Public Service Commission, TSPSC has releaseed the TSPSC Group 4 Answer Keys, along with the answer keys for the other three notifications was released on October 18, 2018. Also, the facility to raise objections for TSPSC Group 4 answer keys was to be made available from today, October 21, 2018 to October 24, 2018. Candidates who have appeared for the TSPSC Group IV and other examinations are advised to note that the commission had momentarily released the answer keys. These preliminary answer key, however were withdrawn due to a technical glitch that mismatched the questions. It is now likely to be released soon. Unconfirmed reports suggest that the TSPSC Group 4 answer keys would be released today. There is no update as to the expected time. However, in case of delay in the release of the answer keys, the commission is likely to extend the dates for raising objections as well. Candidates are advised to keep checking the official website tspsc.gov.in for update. Information regarding the release of answer keys would also be published on the page, as and when available. The examination was conducted on October 7, 2018. 1. TSPSC has conducted written Examination for the above notifications on 07/10/2018. 2. The Preliminary Keys of these notifications are available on Commission's website from 21/10/2018. 3. The objections on the Preliminary Keys will be accepted online on TSPSC website from 23/10/2018 to 29/10/2018. 4. Candidates are advised to note the above dates and submit their objections through the link provided. 5. Objections received beyond 29/10/2018 will not be considered at any cost. TSPSC Group 4 Answer Keys: Telangana State Public Service Commission is going to release the answer keys for the Group 4 examinations soon. The commission has always released the answer keys within a week after the completion of the recruitment exam. The candidates can check the answer keys through the official website of the commission, tspsc.gov.in, once released. The examination was conducted on Sunday, September 7 for the recruitment to 1595 vacant posts. TSPSC Group 4 answer keys: How to download: Visit the official website, tspsc.gov.in. Click on the ‘answer key’ link. A pdf file with answer keys will appear on the screen and Download it, and take a print out for further reference. The selection will be based on the merit secured by the candidates in the objective type examination. Those candidates who qualify in the TSPSC exam will be called for verification of certificates, community and category-wise. TSPSC releases answer keys within a week after the completion of the recruitment exam. TSPSC answer key will be released on the official website of the commission, tspsc.gov.in. The Group 4 recruitment is being done for Junior Steno, Typist and Junior Assistant in various departments of Telangana Government. Step 5: Click on the "Answer key"
గ్రూప్‌-4 నియామక పరీక్ష ప్రాథమిక సమాధానాలను (కీ) తెలంగాణ పబ్లిక్‌ సర్వీస్‌ కమిషన్‌ (టీఎస్‌పీఎస్సీ) విడుదల చేసింది. రాష్ట్రంలోని గ్రూప్‌-4, జీహెచ్‌ఎంసీ బిల్‌కలెక్టర్‌, బెవరేజెస్‌ కార్పొరేషన్‌, ఆర్టీసీ జూనియర్‌ అసిస్టెంట్‌ పోస్టులకు కలిపి ఉమ్మడిగా అక్టోబ‌రు 7న రాత‌ప‌రీక్ష నిర్వహించిన విషయం తెలిసిందే. అభ్యర్థులు టీఎస్‌పీఎస్సీ వెబ్‌సైట్‌లో ‘కీ’ని పొందొచ్చు. సమాధానాలపై అభ్యంతరాలుంటే అక్టోబరు 23 నుంచి 29 వరకు టీఎస్‌పీఎస్సీ వెబ్‌సైట్‌ ద్వారా తెలియజేయొచ్చు. GENERAL KNOWLEDGE - PRELIMINARY KEY FOR GROUP-IV AND OTHER THREE NOTIFICATIONS (NOTFN.NOs.10/2018, 11/2018, 17/2018 and 18/2018). SECRETARIAL ABILITIES - PRELIMINARY KEY FOR GROUP-IV AND OTHER THREE NOTIFICATIONS (NOTFN.NOs.10/2018, 11/2018, 17/2018 and 18/2018). The objective type examination was held at various centers located at Hyderabad, Karimnagar, Khammam, Warangal, Nizamabad, Mahaboobnagar, Medak, Nalgonda, and Adilabad. The final selection of these posts will be based on marks secured in the examination either online or omr based. Those candidates who qualify in the Examination in order of merit will be called for verification of Certificates, Community and Category wise for the vacancies available as required. The minimum qualifying marks for Selection are for OCs 40%, BCs 35% SCs and STs 30%. The minimum qualifying marks are relaxable in the case of SC/ST/BC at the discretion of the Commission.